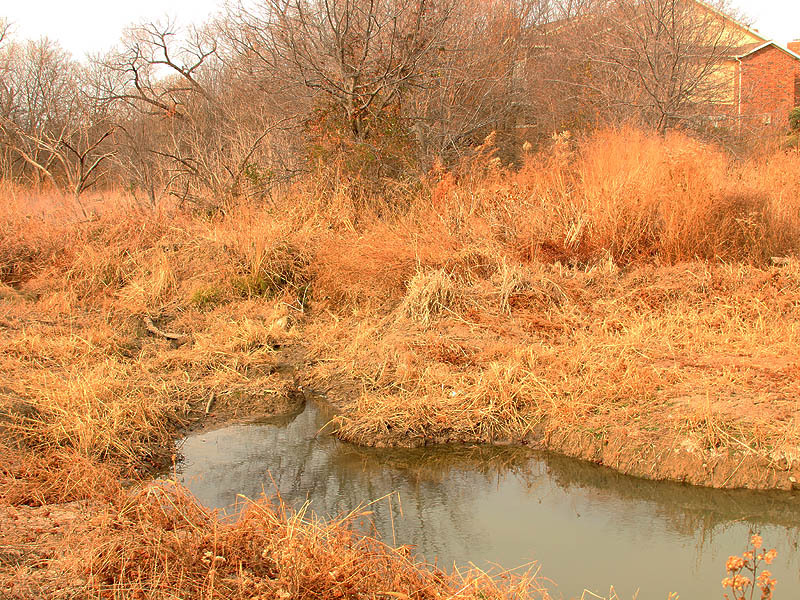 For this project we explored two stream beds for the purposes of observing and documenting evidence of Beaver activity. 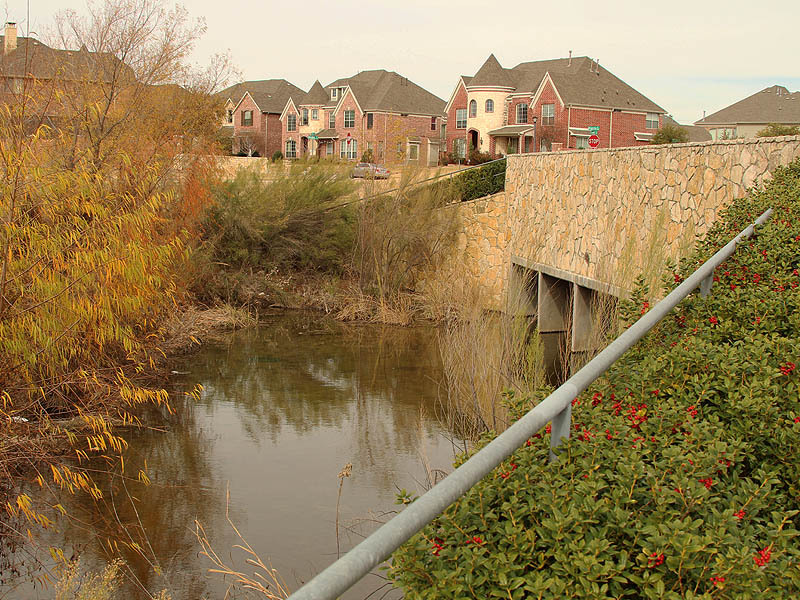 The small creeks we chose were located at opposite corners of an approximately six square mile rectangle of suburban North Texas. 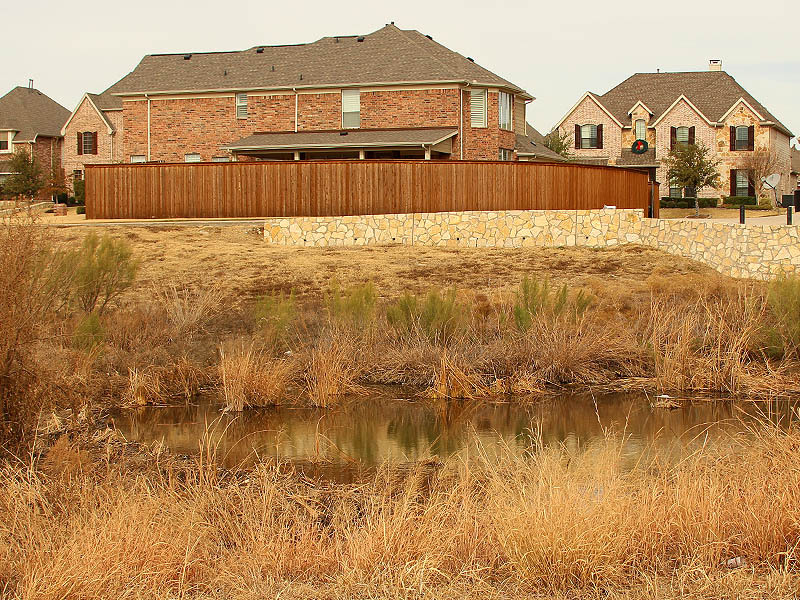 Six square miles of suburban north Texas. 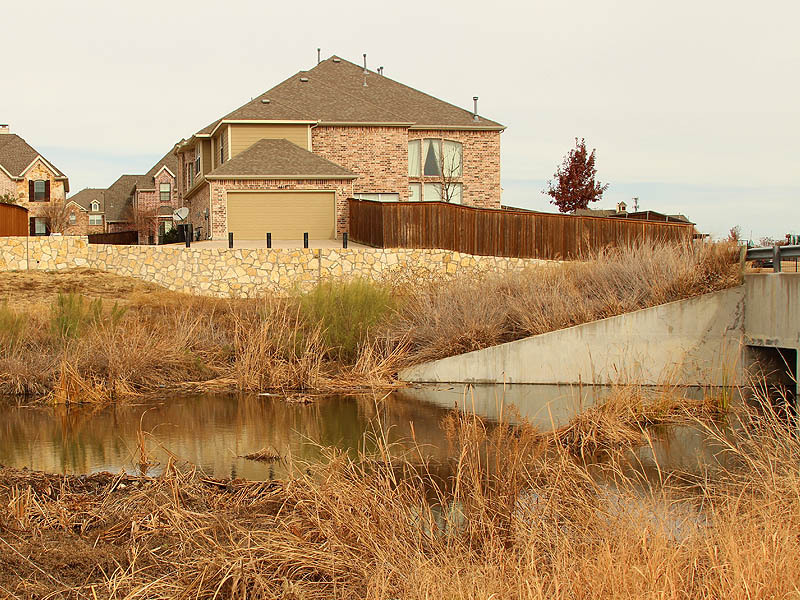 This dam has created an interesting pond surrounded by almost otherworldly-looking habitats. The dam here is made up mostly of branches and mud, and probably best represents what most people imagine when they think of a Beaver dam. 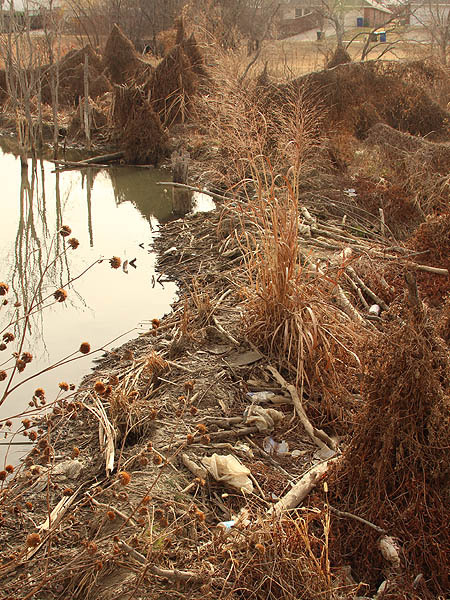 All of the other dams we found were constructed almost entirely of reeds and mud—adobe dams. A Beaver slide. 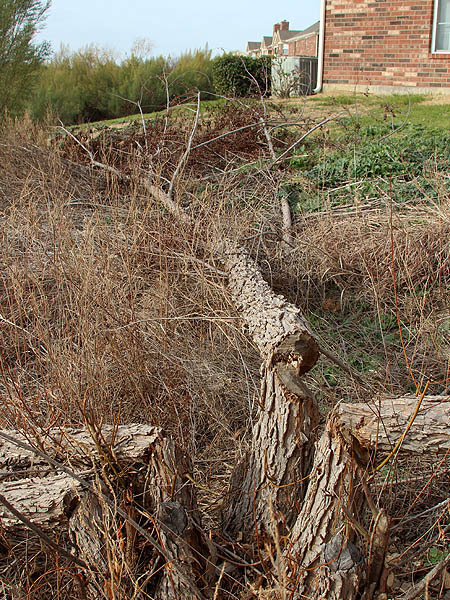 This is a placed used by the Beavers to enter and exit the water. 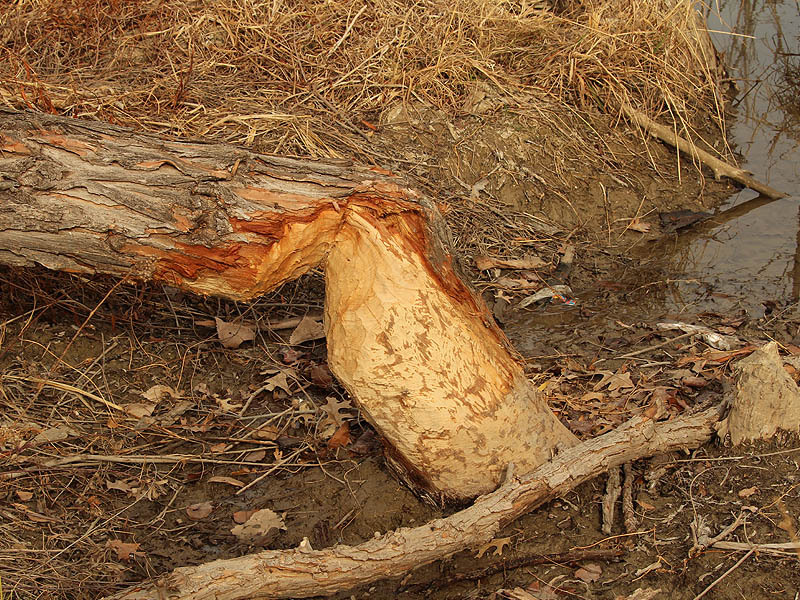 Recent evidence of the Beaver’s handiwork. A large Black Willow felled by Beavers. 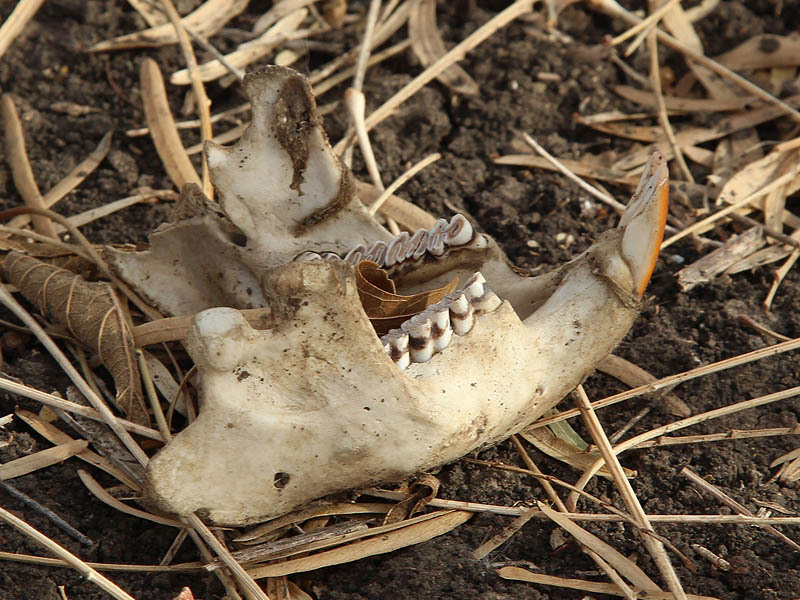 The lower jawbone of a deceased Beaver. Another Beaver slide, this time as viewed from the pond. The Beaver’s pond. Notice the dam in the lower right-hand corner. This is the dam that was recently destroyed. 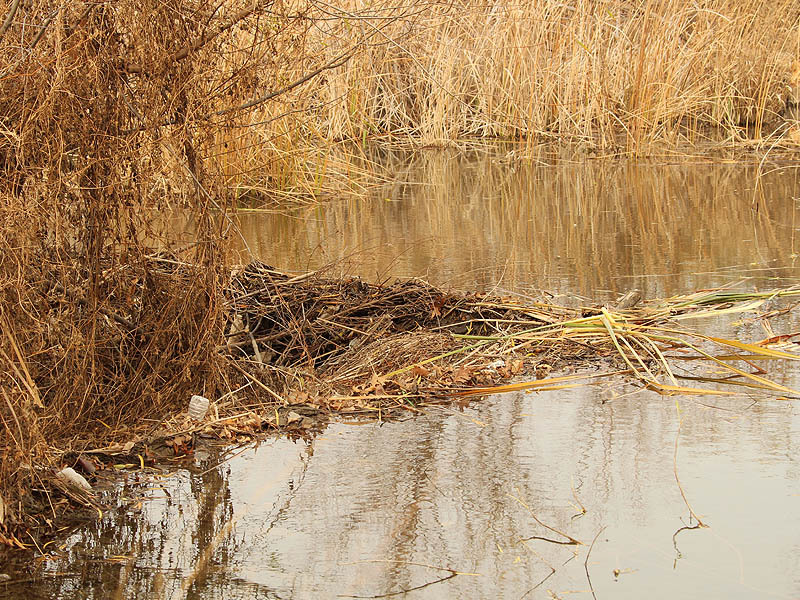 This time last year the dam was intact and was actively maintained by the resident Beavers. Evidently, somebody took advantage of the low water levels caused by the extended drought, and used the opportunity to remove a large section of the dam sometime during the summer. Beavers are not that easily defeated, however. There is still ample evidence of their efforts to be found at this site, and much of it is very recent. My guess is, that if left unmolested, the Beavers will soon have this dam reconstructed. This is the spot where the section of Beaver dam was removed. 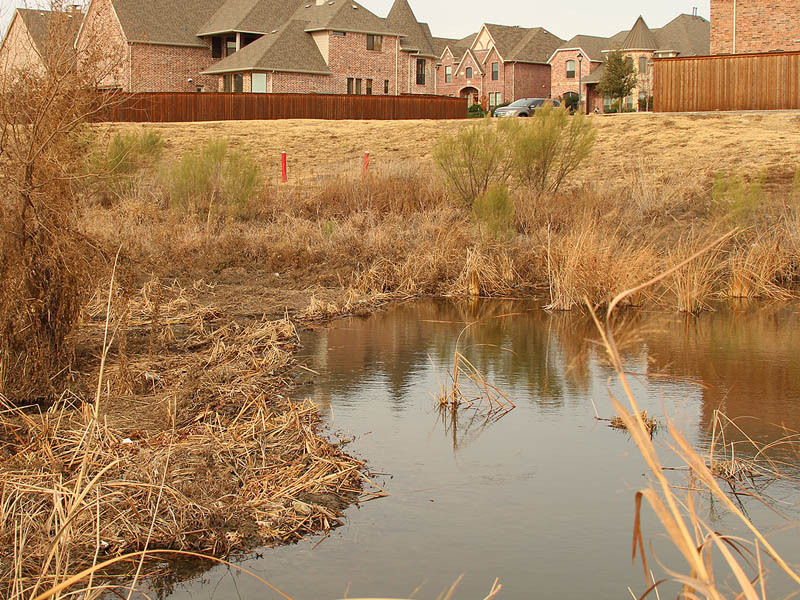 Both of the trees in this picture were once contained inside the boundaries of the Beaver’s pond. This is how the pond looked last March. 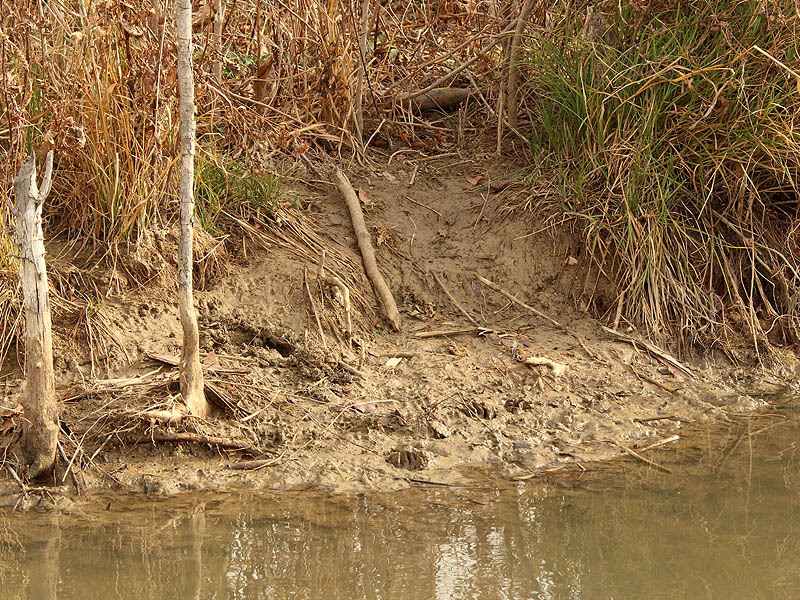 Evidence of recent Beaver activity near the destroyed dam. 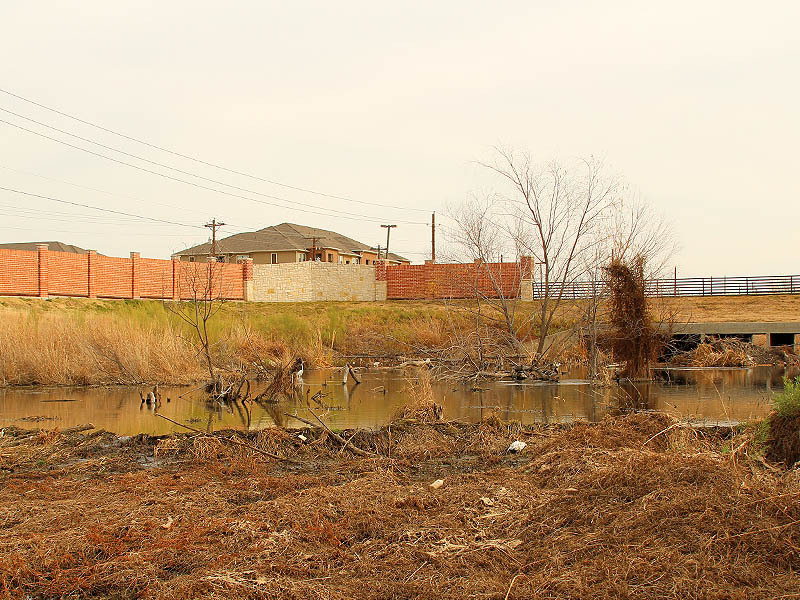 All three of the dams in the southwest corner of the survey area were built in close proximity to bridges. 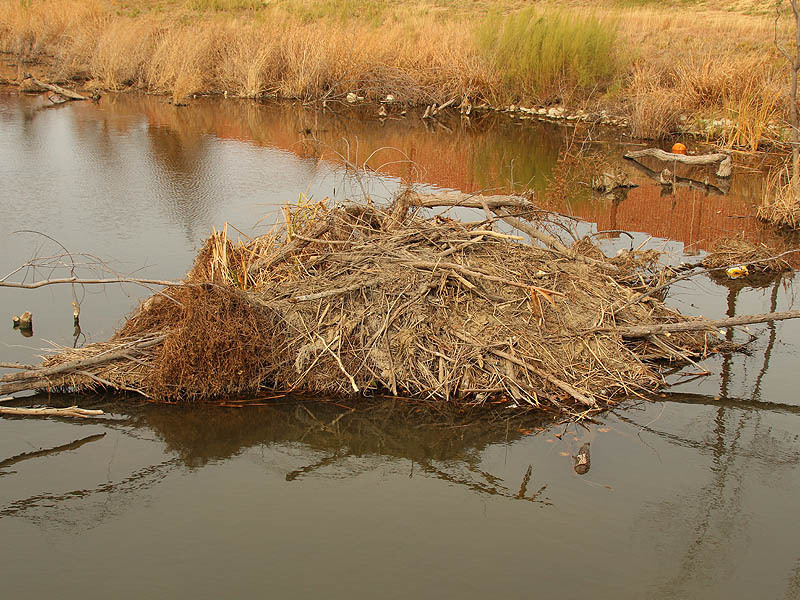 Something about these structures seem to inspire Beavers to locate nearby. 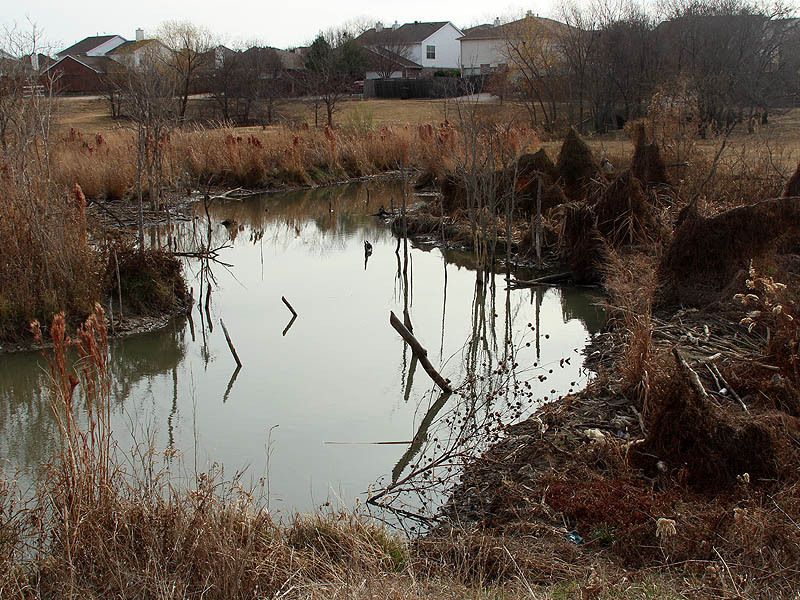 The Beavers at this spot have created a large pond that attracts a variety of different wildlife. 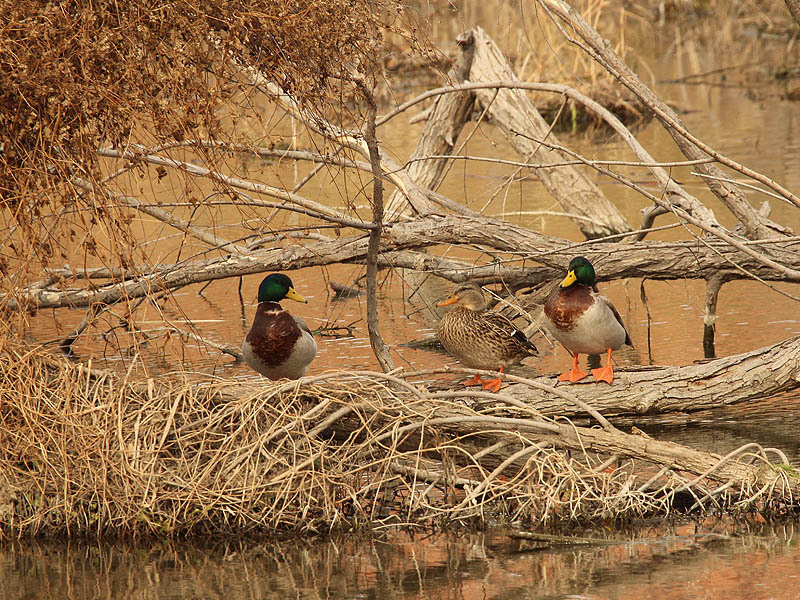 While on site, we observed Gadwalls, Mallards, Great Egrets, and Red-eared Sliders. This Beaver pond is unique in that of the five it is the only one with an obvious lodge. 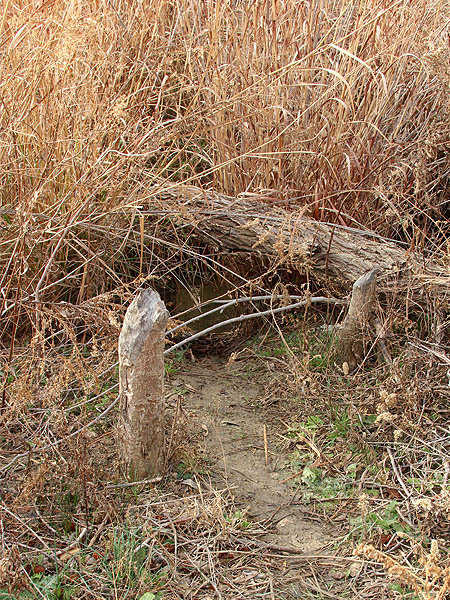 The Beaver’s den is located just next to the bridge, and is constructed of a pile of branches and mud. 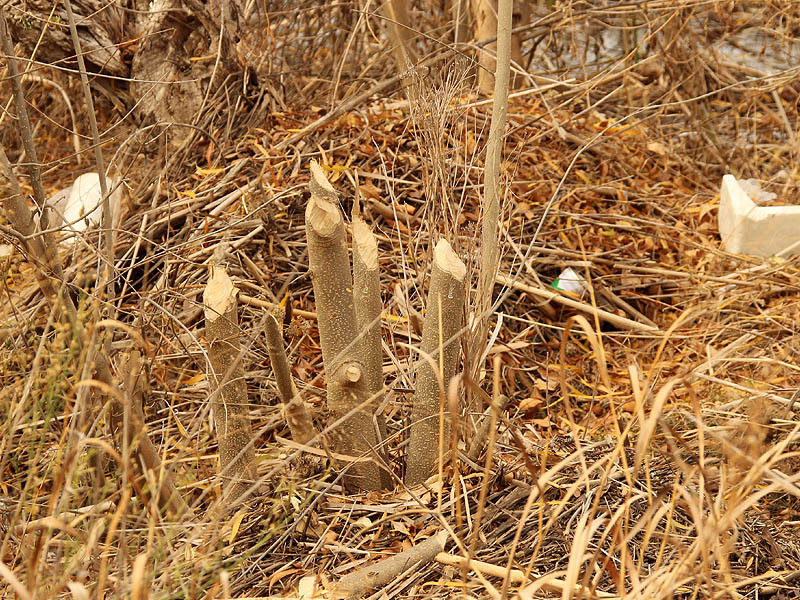 The Beavers took down many trees when they moved into this spot—mostly Black Willows. 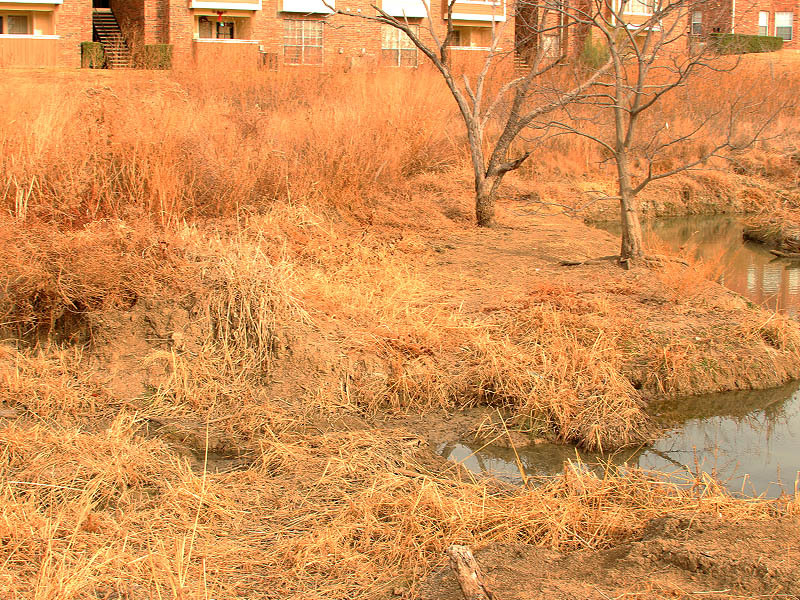 They also worked hard to clear their newly formed pond of reeds and other vegetation so that the vast majority of it is open and unobstructed. 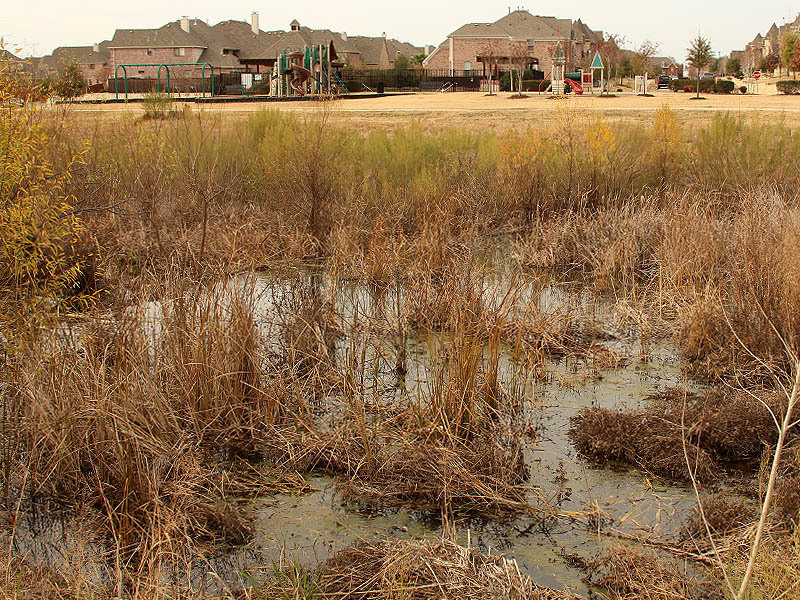 This may account for this pond’s appeal to other types of wildlife. 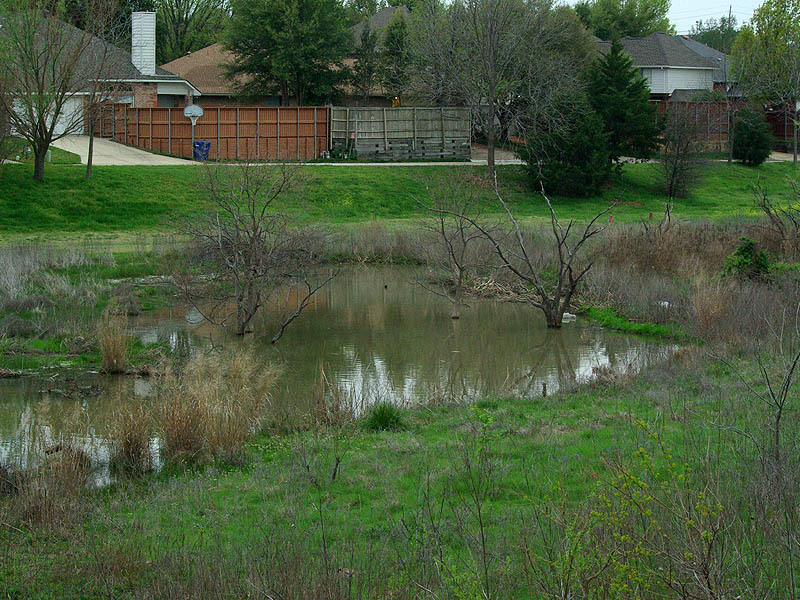 A large, open suburban Beaver pond. 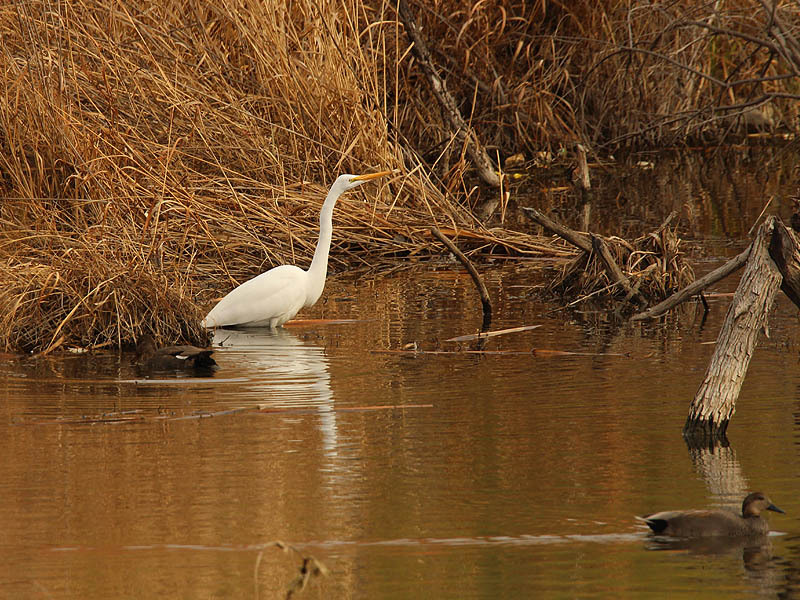 A Great Egret and a pair of Gadwalls. 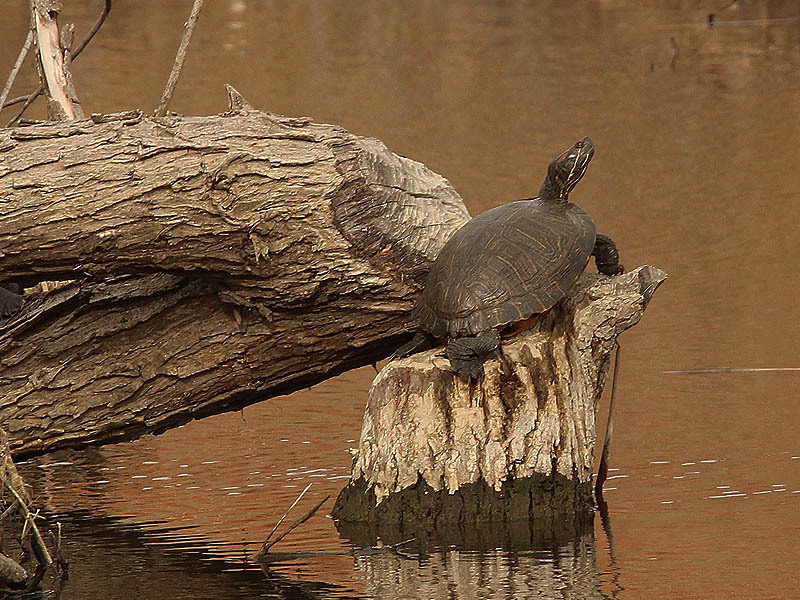 This Red-eared Slider has hauled himself out of the water and onto a tree felled by the resident Beavers. Gadwalls coming in for a landing on the Beaver pond. This is the view of the pond as seen from the bridge. This is the newest dam of the five. Construction almost certainly started within the last two months or so, and it is on going. The dam is complete, and the pond is full, but most of the flooded vegetation still remains. 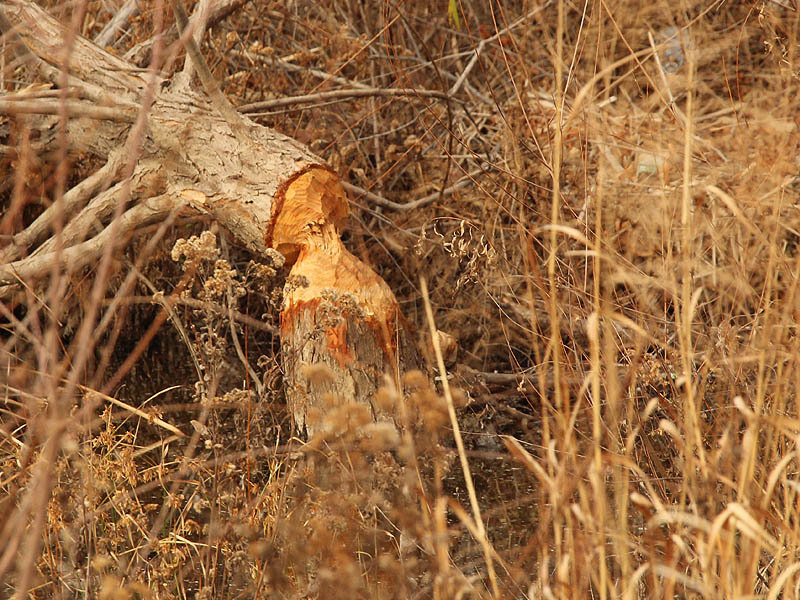 Through the rest of the winter and spring the Beavers will be working diligently to remove as much of it as they can. 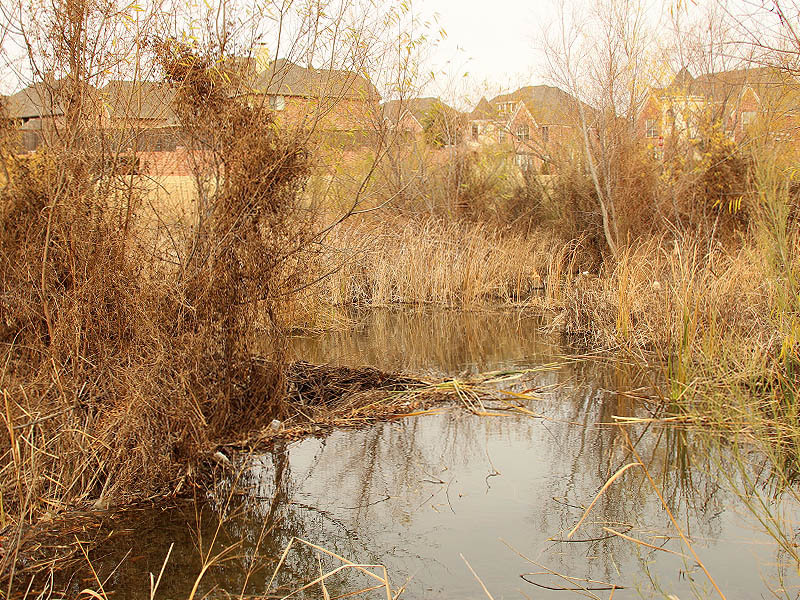 The Beavers will work to clear this new pond of vegetation. Something about these bridges seems to inspire the Beavers to build dams nearby. 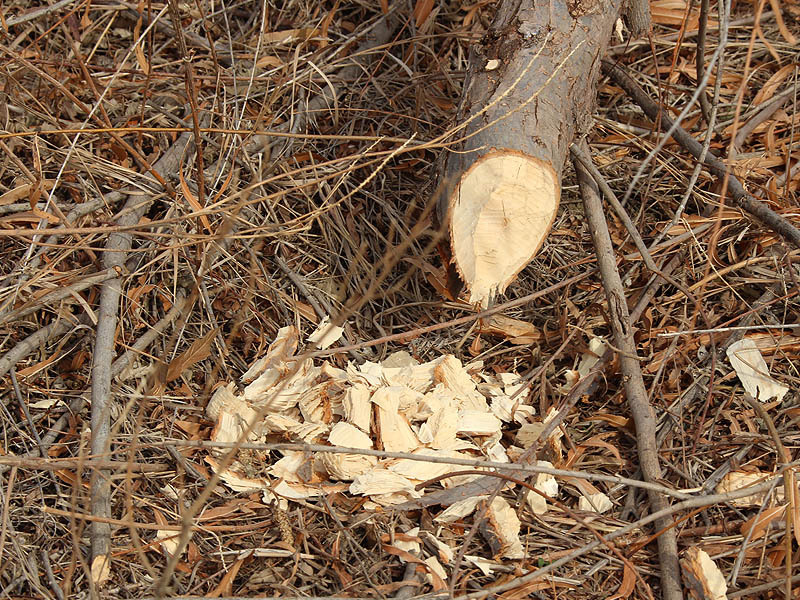 More evidence of Beaver activity. This is the dam. 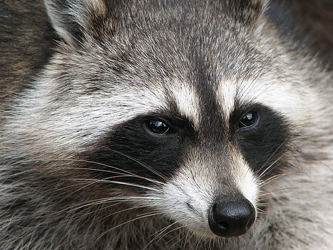 it is constructed mostly of reeds and mud. 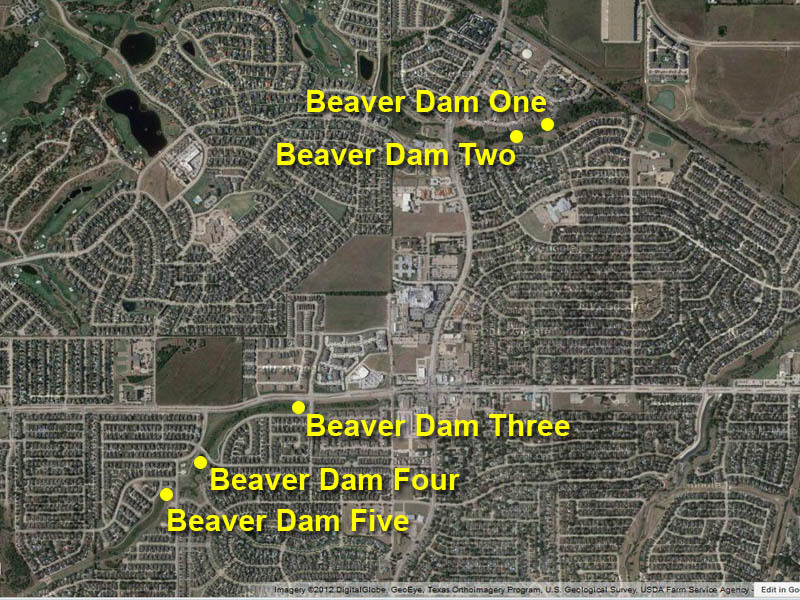 The Beaver dam in context. This is the oldest dam on this section of the creek. Many years ago a pioneering Beaver built a dam here, taking down many of the ornamental trees in a nearby park in the process. 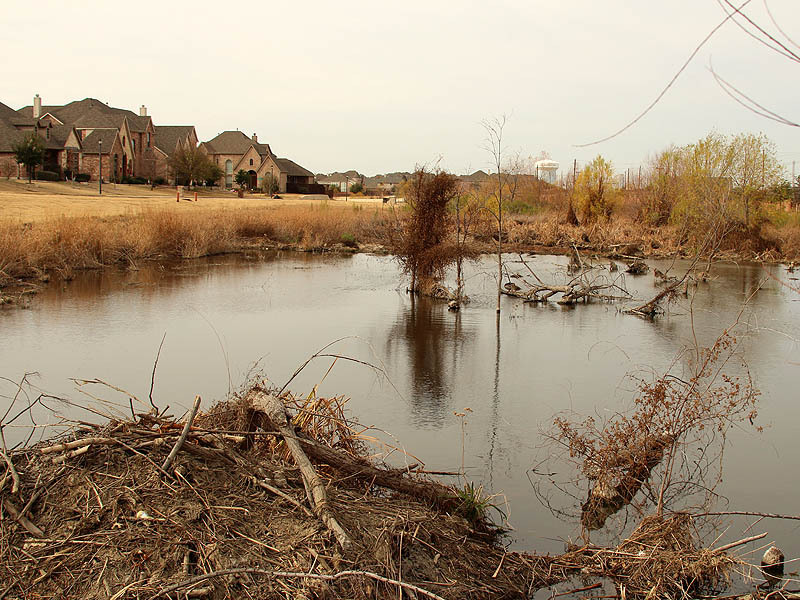 The neighborhood’s Home Owner’s Association quickly took action to have the offending Beavers removed, and the dam fell into disrepair for a many years. Recently this has changed. 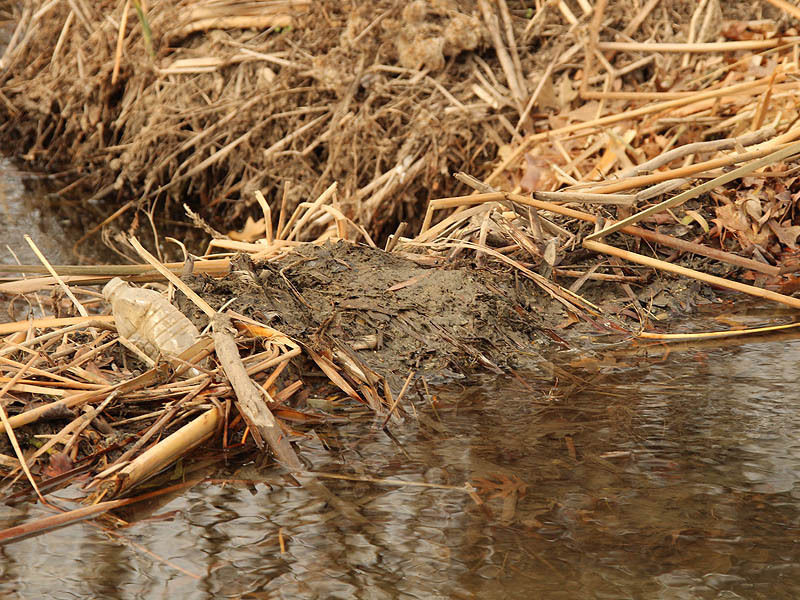 The dam’s integrity has been restored, and there is ample evidence of recently Beaver activity in and around the newly expanding pond. This Beaver dam is holding water once again. Again, a nearby bridge seemed to inspire the creation of this dam. The mud and reed dam is visible in this picture. Recently added mud shows that the Beavers are active here once again. 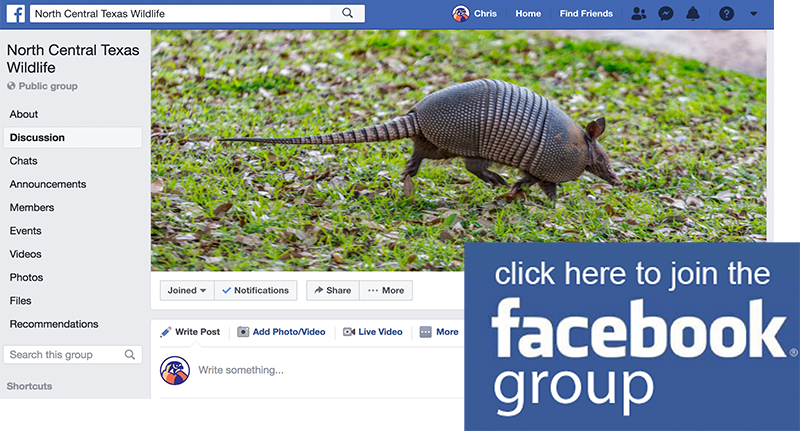 Next Next post: Ornate Box Turtle – Extinct?